I have been working on cleaning out my office. It’s about a decade past due. I may have to call in an archeologist to dig though and catalog some of the artifacts. Planted some new stuff this week – gerbera daisies argyranthemum, plectranthus and angelonia in deco pots for fall sales to go along with the Wave petunias and calibrachoa deco pots. We will also have a few of these items available in #4.5 pots. Also booked a big last minute fall program that has had us scrambling for plugs to cover the program. I will get you some pictures and video next week. I am out of the office tomorrow. Have a good weekend and see you all Monday! We are doing a small trial of Ice Punch this year (quantities are limited), but we have received some requests to post a picture so you can see what you are booking. I am behind on working on the website. 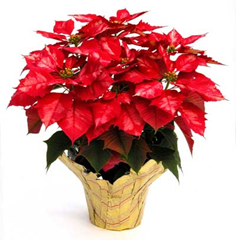 I will try to get all the poinsettia variety pictures posted as soon as I can. But for now, here is Ice Punch.